1. Chuck the Dog Is Dead! Are you looking for a gateway band into Grindcore or just looking for a great Grindcore band in general? The new Sucking Leech album Common Sense is definitely the place to start. This band was originated in Germany, starting back in the year 1997 and still continue onto until this very day having released 4 full-length albums along with 1 EP. But does this album live up to their past albums? Is this album worth the money? Is it even worth checking out? You'll have to keep reading to find out! 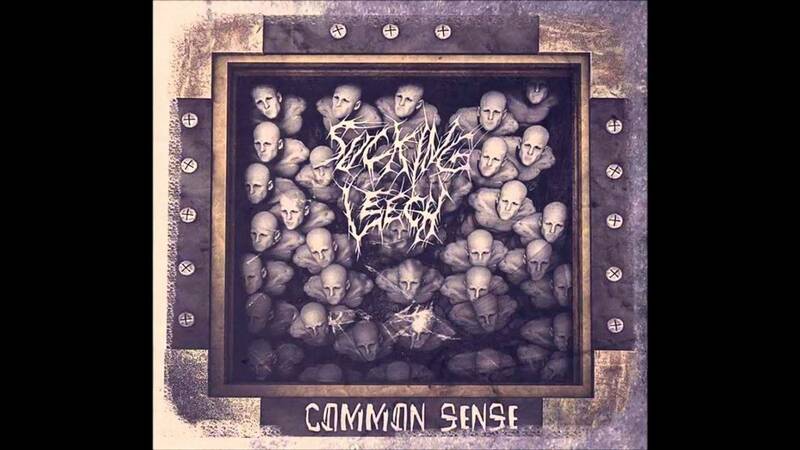 To start, the album Common Sense is a 15-track (Full-Length) album that really does an amazing job at both equating & integrating both Death Metal & Grindcore allowing the music to be very extremely versatile. It satisfies the needs and grasps both the gateway entry level metal-heads along with even the most brutal of metal-heads. Coinciding with the fact that the music in itself is quite incredible due to it's catchy, melodic side as well as the high-quality whilst still acquiring the remnants of subliminal rawness that gives it a very gritty & intense atmosphere. Even though it keeps that atmospheric surrounding in its background, the band manages to throw in a lot of humor in as well. Just look at the song names & you'll understand exactly what I'm talking about, trust me. Yet, not all songs have a complete comedic attribute to them. A lot of the music revels around the ideology of a revolution, government corruption, etc. in which is unveiled in an Anarchistic kind of way which gives the lyrics themselves a variety making every song a new experience. Instrumentally & vocally, I feel as if they were very well done to say the least! Especially, the skillful combination executed in both during every single one of their tracks. The guitars are fast, very melodic like I said before, and just overall empowering. Along side the guitar we have the drums and I must say, they fit extraordinarily. The drums themselves are extremely powerful as well, especially compared to the other bands within the genre of Grindcore. There are 3 sets of vocals in which include the aggressive highs, the Grindcore-style and then you got yourself the Death-Metal style. Personally, my absolute favorite vocal style here has to be Death Metal, but the other two are great as well. And when it all comes together, it all surmounts into an incredible work of art that all of us metal-heads love to hear. If you're like me, you'll definitely love the heaviness brought forth! We're hitting the light at the end of the tunnel with this review! So, is this album worth listening to? Yes, no doubt about it! This is another great additional to Sucking Leech's discography, so give this album a listen and give their older work a listen if you haven't yet already. One thing I brought up previously that I feel I must mention again during the closing of this review is that it truly fits the taste of a wide-variety of metal-heads. If you're not into Grindcore this is the band to start and if you do like Grindcore then you must check 'em out! I promise you will not regret it! If you love the music, show the band some support & check out their social media sites, merchandise & perhaps even get yourself a copy of their new album Common Sense! It's only common sense!